Thanks to the continuous working by Jay Freeman (Saurik), we now find the latest Cydia impactor tool with various bug fixes and improvements. And just as you might have already known, this is the utility that has created to sideload IPA files to iOS Devices at the same time for installing APKs to Android. With the latest trend of semi-untethered jailbreak, the use of Cydia impactor wins more attention these days which has now become one of the important parts of jailbreaking the iDevice. In concerned the state of iOS 12 jailbreak, we are still at an uncertain stage where nothing is yet confirmed. But there are many important pieces of work to keep remembering that encourages the new prospect of jailbreak 12. 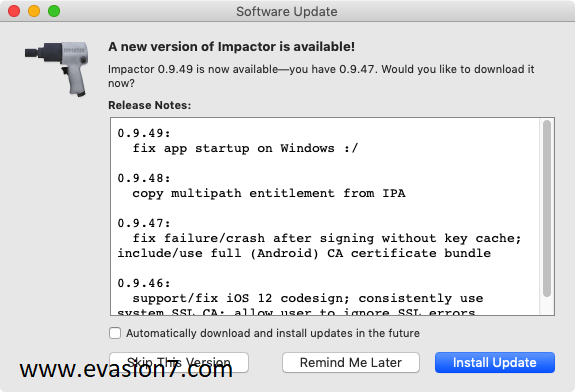 In that way, the recent update of Cydia impactor 0.9.46 is important from which the support up to iOS 12 is added. And that is nothing to be surprised as we found recent work in the side of iOS jailbreak as well with support to the previous iOS 11. The latest jailbreak in work is Unc0ver jailbreak for iOS 11.0 to iOS 11.4 beta 3 which also follows the same semi-untethered flow. About a month back from the date today, we found Saurik silently released two important updates to Cydia impactor. One is version 0.9.48 from which the developer has managed to fix the trouble with the multipath entitlement exploit which is used in creating the unc0ver jailbreak tool recently. We often heard some users having the trouble in getting the exploit to work finely. And thanks to the new tool update, it is now paired with unc0ver RC6, resolving the trouble. When that comes for the certain fix, the next most recent update comes as Cydia impactor 0.9.49. This packs one of the main fixes including for the trouble that has prevented Cydia impactor supporting for some Windows operating desktops. So with no trouble hereafter, Cydia impactor tool will run through Windows, Mac, and Linux. If you have not yet downloaded the tool on your Windows, Mac or Linux to work for your iDevice, you can Download latest Cydia impactor through the official source. If not, follow the prompt and update the tool for the latest. And soon once you get a new jailbreak update to the latest iOS 12 or iOS 11, you now have the most stable Cydia impactor tool version to download. This is free as always for Windows, Mac and Linux.